Shane Shirley : 105,000 Facebook Wishes for 105 Year Old Direct Relief Volunteer? Are You In? 105,000 Facebook Wishes for 105 Year Old Direct Relief Volunteer? Are You In? If you are anything like me, you know the joy that volunteering can bring to your life. Well at 104 years old, Edythe Kirchmaier has been serving others for 40 years as a volunteer with Direct Relief International and she most certainly emanates the joy of giving. Edythe's 105th birthday is coming up on January 22 and she hopes to inspire the world to make a difference, as she has, by raising awareness for her favorite charity to which she’s dedicated much of her life, +Direct Relief . 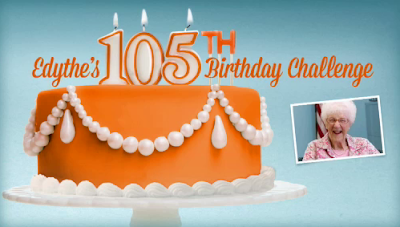 The goal of Edythe’s 105th Birthday Challenge is to generate 105,000 virtual birthday well wishes for Edythe, which will equate to 105,000 Facebook fans for Direct Relief. 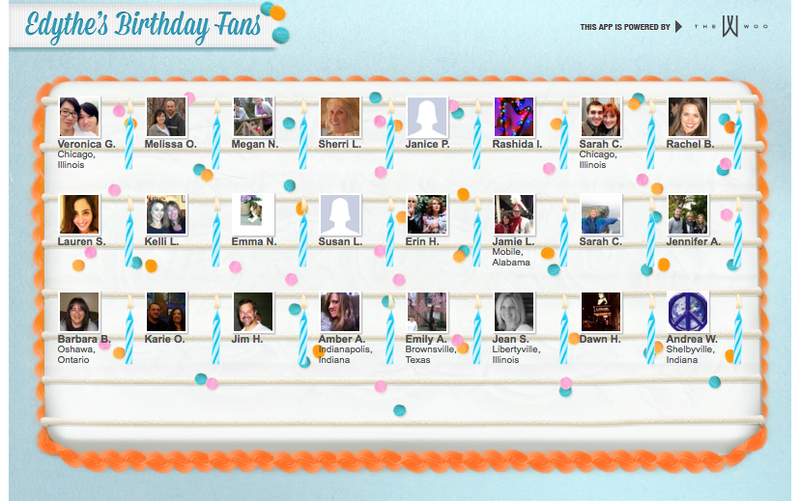 We can all make Edythe’s birthday wish come true while strengthening Direct Relief's mission. 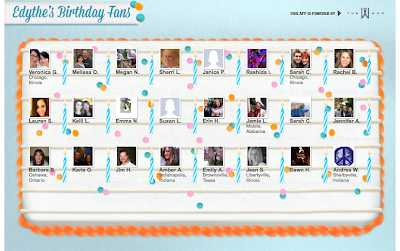 To honor Edythe and celebrate her milestone birthday on January 22, 2013, Direct Relief has created the world’s largest (virtual) birthday cake, a Facebook application called Edythe’s 105th Birthday Challenge, which will enable the world to light a candle and wish Edythe a happy birthday. Well-wishers can participate in Edythe’s 105th Birthday Challenge by visiting the app on Direct Relief’s Facebook page and joining the conversation on Twitter using the hashtag #lightacandle. Since 1948, Direct Relief International has worked to improve the quality of life for people affected by poverty, disaster, and civil unrest at home and around the world. Direct Relief works to support the work of healthcare providers in the USA and in more than 70 countries, equipping them with the medicines, supplies, and equipment so they can care for people in need within their communities. The organization has been among the world’s largest medical suppliers in Haiti since the devastating 2010 earthquake and they are making a difference every day. 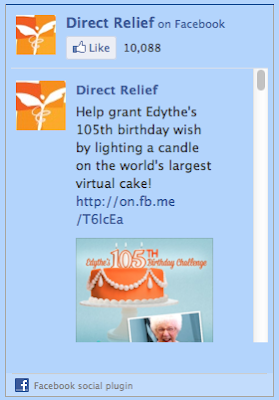 I say if Edyth can volunteer 40 years of her life to help them out, I can give a little like on Facebook and light her virtual birthday candle on her cake to make a wish for 105,000 Likes to strengthen Direct Relief International's mission. Are you in?